Presenting an event the size of the Fall Roundup is no small job. Months and months of planning go into it before the date even arrives! We encourage AA groups and/or individuals to get involved in order to make it a great Roundup. Drop off flyers to groups around town. Assist one out-of-town speaker during their stay by answering questions, helping to resolve any problems that may arise and just being a friendly face. This will require 5 – 6 people. Read the opening or Steps at the podium tables before each speaker. 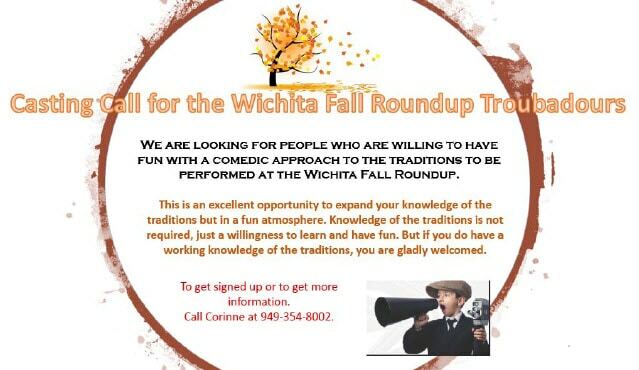 If you feel you would like to participate, please contact us by email at wichitafallroundup@gmail.com or contact Rhea directly at 316.734.5968 . This is a great opportunity to get those your sponsor involved in the recovery community outside of the meeting rooms, too! Interested in joining the WFR Troubadours? We’re putting on a skit this year…and we need a few people to hellp! If you are interested, please Contact Corinne W. as soon as possible at 949-354-8002.